Pears from Finnriver Farm now available at the Port Townsend and Chimacum Farmers Markets. Marked by a great abundance of local veggies and fruit, this week is National Farmers Market Week. We are celebrating our local farmers markets this week along with communities across the country. Both in Jefferson County and nationally, the impact of farmer-to-consumer sales is far greater than it appears on the surface. Farmers markets bring communities together, positively influence community health and support local economies. In this newsletter I am going to share a few of the ways in which farmers markets benefit community. It is plain and simple that ripe, fresh fruits and vegetables taste better. However, they are also better for us. Produce loses nutritional value as time elapses from the time of harvest. Most Jefferson County Farmers Market (JCFM) vendors travel less than 50 miles to bring fresh produce to the Port Townsend and Chimacum Farmers Markets. JCFM farmers bring fruit and vegetables to market that are often picked the day before and, sometimes, the morning of market. Compare this to fruit and vegetables available at most supermarkets, which travel an average of 1,200 miles before reaching grocery store shelves and are often available to customers several weeks after harvest. At the Jefferson County Farmers Markets we strive to ensure that all community members have access to fresh, local food. Our food assistance matching programs, Gimme5 and Fresh Bucks, make it easier for all shoppers, regardless of income, to eat nutrition-dense food from our local farms. Since the inception of Gimme5 in 2013, JCFM has provided community members who are low-income with more than $37,000 in matching funds for healthy food from our local farms. In turn, these matching funds have helped low-income shoppers bring home nearly $140,000 in local farm-fresh and artisan foods. JCFM supports community health and food security with the partnership of individual donors and sponsors including : Jefferson Healthcare, the Port Townsend Food Co-op, United Good Neighbors, the USDA and Pane d’Amore Bakery. Learn more about Gimme5 and Fresh Bucks here. One of the important community benefits of farmers markets is that they boost local economies by retaining more of the money we spend in our community. A 2010 study by USDA’s Economic Research Service compared producers selling salad mix, blueberries, milk, beef, and apples locally with producers of the same products selling to mainstream supply chains. This report found that “nearly all of the wage and proprietor income earned in the local market chains is retained in the local economy.” This “economic multiplier effect” helps create jobs and boosts economic activity. Growers selling locally create 13 full time farm operator jobs per $1 million in revenue earned. Those that do not sell locally create only three jobs. To celebrate National Farmers Market Week, this Saturday Chef Arran Stark will cook up some local produce at the Port Townsend Farmers Market from 9:30am to 10:30am. We also have some great music for you at our Port Townsend and Chimacum Farmers Markets: Fungi Mama from 2pm to 6pm at the Port Townsend Wednesday Farmers Market, Yesango from 10:30am to 1:45pm at the Port Townsend Saturday Farmers Market, and the Chuck Easton Band from 10am to 2pm at the Chimacum Sunday Farmers Market. Other things to celebrate this week include: plentiful berries, the first of the Finnriver apples and even peaches grown by SpringRain Farm and Orchard. Also, Mystery Bay Farm is celebrating National Goat Cheese Month all August. Visit their booth to try their special chevre of the week. Yum! See you soon at the farmers market. As we recognize the community benefits of farmers markets, it seems appropriate to look at the history of our markets. Last week I visited Denise Joy, owner of Mountain Spirit Herbal Company and a founding member of the Port Townsend Farmers Market. With 24 years of vending at the Port Townsend Saturday Farmers Market under her belt, she is a great historian for our markets. Denise has served the Jefferson County community as an herbalist and practitioner for more than 30 years. “Plants are like people,” says Denise. “Each one has a distinct personality. Without knowing their personalities it is really hard to mix them together.” Over the years of studying and learning from plants, Denise has mastered the art of combining medicinal herbs to heal and care for her community. The knowledge she gained through books and self-teaching has been augmented by studying with renowned herbalists and healers in Hawaii and Washington. Denise makes Mountain Spirit products using herbs from her home garden as well as wild crafted herbs, which she and a circle of friends harvest. 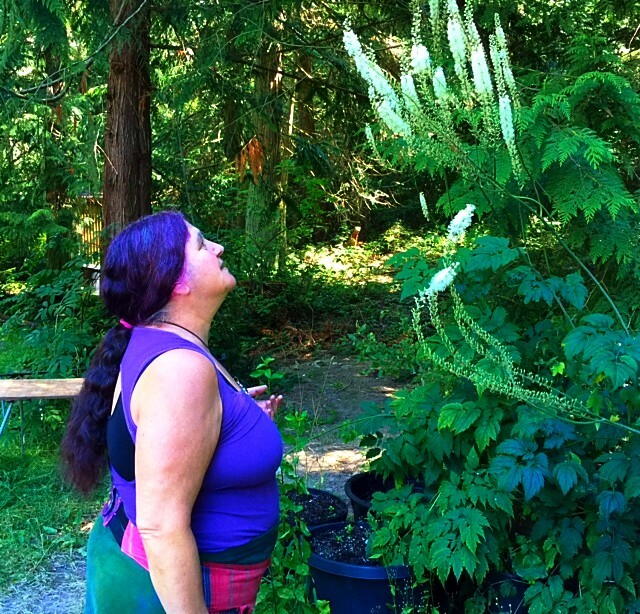 Denise is the carrier of an herbal tradition passed orally from woman to woman. She started training at age eight with her Ukrainian Gypsy great grandmother, who taught her the healing power of plants after Denise suffered a puncture wound to the liver caused by a bicycle accident. A mother of two, she later used herbal remedies to care for her children. Friends took notice and Denise started making tinctures and salves in small batches for her community. 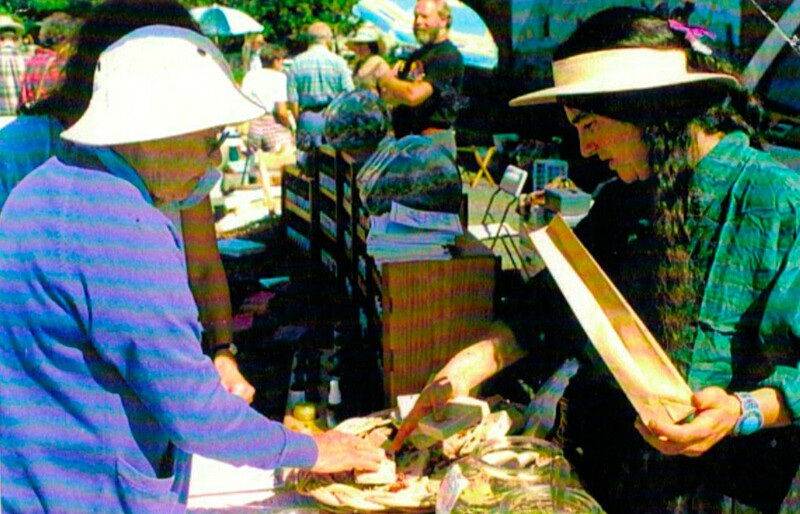 In 1991, one year before the Port Townsend Farmers Market was established, Denise and a couple of other farmers gathered in front of the Port Townsend Food Co-op weekly in its old uptown location to sell the veggies, tinctures, salves and teas that they grew and made by hand from their farms and home gardens. When the Port Townsend Farmers Market was established in 1992, Denise was there, working with a handful of other farmers to manage the market. Each vendor took a turn managing the market for a month or so. Since its inception, the Port Townsend Farmers Market has moved from the parking lot by Elevated Ice Cream and various locations in downtown Port Townsend to its current locations on Polk and Tyler Streets. Denise describes the Elevated parking lot market location as “a wind tunnel” where you had to wear a winter coat even in the summer. Over the years the Port Townsend Farmers market has grown from its original handful of vendors to over 70 vendors, including more than 30 Jefferson County farmers. Like the Jefferson County Farmers Markets themselves, Mountain Spirit Herbal Company has experienced the winds of change. Last year, Denise was faced with threats from the Food and Drug Administration (FDA) to shut down her business. Her small home-based business was required to follow the same procedures and tracking as large drug companies in order to meet FDA regulations. With the help of a lawyer and much support from folks in our community, Denise has worked to bring her business into compliance. Mountain Spirit shoppers at the Port Townsend Farmers Market will see that Denise has changed her labels for the salves and oils she has used to care for her family and community to identify them as “cosmetics.” Her tinctures are now classified as dietary supplements. Denise is hopeful that her hard work to come into compliance will be rewarded by the alleviation of the FDA threat. You can find Mountain Spirit teas, tinctures and salves at the Port Townsend Saturday Farmers Market, the Port Townsend Food Co-op and online at mountainspiritherbals.com. Introduce yourself to Denise this Saturday and check out her same trusted products with their new labels. Holy Strawberries! Red Dog Farm expects to pick 100 flats this week. Let’s share in the bounty! Now is the time to freeze, jam, and dry. Red Dog is offering special flat prices at both the Port Townsend Saturday and Chimacum Sunday Farmers Markets. They have lots of other summery, delicious veggies as well! This week Midori Farm will have their new seasonal kraut available in limited quantities, Kohlrabi garlic scape kraut. Also new this week, Midori will have fresh shell beans, cherry tomatoes, Shishito frying peppers and lots of heirloom tomatoes. Nash’s veggie of the week is BASIL!! Get your basil here and pick up a few heirloom or slicing tomatoes to compliment that basil. Throw in some mozzarella and you'll have a beautiful caprese salad! Delish!! If it's overwhelming to make pesto, all you have to do is puree basil into olive oil and freeze in an ice cube tray and you'll have basil oil whenever you're ready for it! (Pro tip: works with any herb!) Romanesco is making its début at the Nash’s market stand this week. It is as tasty as it is beautiful. Try it oven roasted with a little avocado or olive oil. In addition, this week Nash’s has fresh and crunchy green beans, Walla Walla onions, bunch carrots, beets, cabbage, chard, kale, spinach, cucumbers, broccoli and more!